We all know about the Holocaust. We know the names Auschwitz-Birkenau, Dachau, and Treblinka. Those are only three of many. What we don’t learn about in school, or really anywhere outside of Judaism, are the other pogroms. We don’t learn what a pogrom is, or what happens, or why. Not that there is ever a why for a pogrom. Did you know the word “ghetto” is not about Harlem in New York? In Catalonia, now Barcelona, Jews were driven out of Spain. They were driven from their ghetto homes. And then, something worse happened. The Catalonian King took the stones from the Jewish graves left behind, and built them into his castle. 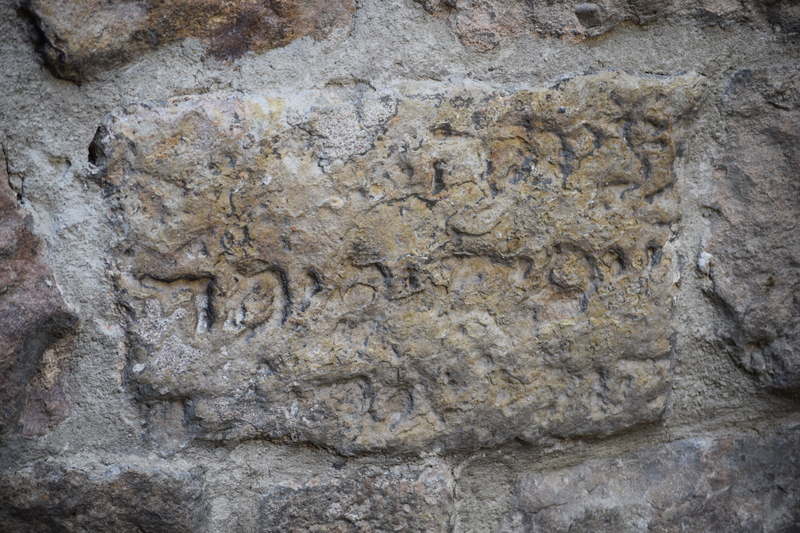 The inscriptions are still visible on the stones used to build the castle and attached cathedral. Is this a warning? The way skulls were built into the structures at Chitzen Itza in the Mayan world, to show enemies what might befall them? It certainly had the effect of making me want to leave Barcelona and never return. The separateness that is a people’s covenant with our G*d is also the separateness that makes countries afraid. If being Jewish comes before everything else, then how can Jews be trusted to fight for the country in which they have landed during diaspora? Jews are reminded again and again how they are not trusted to be loyal to a country before their faith. This past month, as Israel responds to the non-stop rockets from Gaza with great force and works to prevent further more serious threats from underground, violence against Jews has broken out all over the world. In Paris, shops were attacked, destroyed, burned. In Germany, where even the Germans thought they knew better, there are chants of “Die Jew!” In Los Angeles there is Nazi themed graffiti. In Calgary, a man had an Israeli flag tried around his neck and he was then dragged through the street. My own tiny shul in a small town had its’ sign graffiti’d on, and is under police protection. Tisha b’Av is a Jewish fast day of mourning and hope. We mourn the destruction of so much, and we hope for a future that will sustain lasting peace. This year, in the shadow of war and uncertainty, the fast is so much more poignant, so important. Communities will gather, prayers will go up, discussions will be held all over the world. We will stand united as a scattered people, hoping for peace, praying for understanding that leads to an end of the violence and threats.